It’s been a busy day. Once school starts, it is very hard for me to be tapped into what’s going on in baseball during the day. However, all throughout this afternoon, Several bits of information kept coming down about a trade, an injury, and a promotion. I had to take my wife to a couple of doctor appointments after school. As a result, I have not made it home yet. 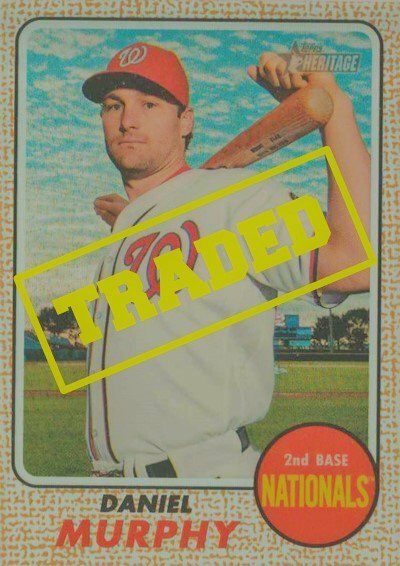 The Cubs acquired second baseman Daniel Murphy from the Washington Nationals in exchange for infielder Andruw Monasterio. Murphy gives the Cubs a left-handed bat that will make them extremely tough against right-handed pitchers down the stretch. Murphy is not in action tonight but will be ready to go for Wednesday’s game in Detroit. I like the deal and it gives the Cubs a little more oomph, most likely at the top of the order and he could be a table setter for Anthony Rizzo. As for Monasterio, He will just switch teams in the Carolina League and now play for Potomac. He just turned 21 in a league where the average player is 23 or 24 years old. His bat is still developing and he can be streaky at times. The Cubs also announced that Yu Darvish is most likely out for the season. He has been diagnosed with two things regarding his elbow and triceps. Neither of which will require surgery, but rather rest. I doubt he can make it back in time for the playoffs at all. Maybe the best thing for him to do is to miss the rest of the year, get his head straight, and come back healthy and re-charged for next year. My favorite news of the day came from Justin Steele who announced that he had been promoted to AA Tennessee one year after undergoing Tommy John surgery. It has been an impressive year as he was pitching in games 10 months after surgery. He’s appeared in nine games so far and has thrown 38.2 innings with a 1.98 ERA and 46 Ks. I expect him to keep going when the season ends as he should be assigned to the Arizona Fall League to get six more weeks of action in. More than likely, he will begin 2019 at AA Tennessee.